In November of 2015 I wrote a blog titled 'The Influence of Fiction and Hollywood on Paganism'. It was mostly me discussing my own opinions on the way that I have seen media change, or at least influence, pagan beliefs over the decades. Lately different discussions on social media have gotten me thinking that I might want to do a similar blog about the effects of popculture and fiction on fairy faith beliefs, although I'll say up front that I doubt I can include all of the ways that modern media is influencing what neopagans believe on this subject. I also want to be clear at the beginning that pointing out that something is a more modern belief is not necessarily a judgment on that belief. I happen to personally agree with some new beliefs, but I still think its important to be clear about what is new and what is older. My goal here is simply to help differentiate between traditional folklore beliefs and modern beliefs rooted in fiction and popculture. As with my previous blog this one is based on my own knowledge of the subject and observations. Summer and Winter courts - this is one of the ones that I personally like and use myself, however as far as I can find it is a newer term for the two courts. Of course as I discussed back in July in my post on the Seelie and Unseelie Courts themselves the entire idea of two courts as such is itself probably comparatively newer as well. Within the last decade or so there have been several young adult fiction series and paranormal romance series which have featured the idea of either a Summer and Winter Court of the Fairies or of courts based on all four seasons, or who use the terms Seelie and Unseelie but also incorporate summer and winter as nicknames for each. This concept has been adopted into fairylore more generally by those who dislike the hard seelie=good unseelie=bad division and feel that summer and winter are more ambiguous and less morally loaded terms. 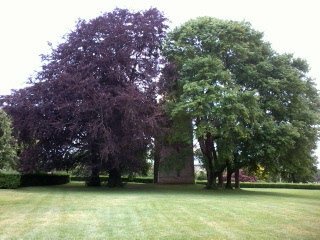 The Grey court - Another idea like the Summer and Winter courts which cannot be found in older folklore as far as I am aware but which is gaining in modern popularity. The Grey Court is a term which I came across in a paranormal romance series based on the Fae, but has also popped up among pagans who believe in fairies as a term for a third more neutral court* or used as a term for the court of those fairies who are more wild and less civilized than the other two courts. In traditional fairylore the more wild fairies would have been termed solitary as opposed to the more civilized fairies or those who prefer to be in groups who were known as trooping fairies. Unseelie as the good guys - Now to be clear all fairies are mercurial and can be inclined to either help or hurt - however those termed Seelie were known to be more inclined to helping while those termed Unseelie were known to be more inclined to hurting. The idea that the Unseelie were all or largely just misunderstood good guys, and more so that the Seelie were the real bad guys**, is entirely from modern fiction, and so common now that it has become a trope of its own. The idea that the Unseelie are just angst ridden bad boys trying to prove they can be good is really really just from modern fiction. Yes there are stories in folklore of beings generally labeled Unseelie doing helpful things or falling in love with mortals and so on, but those were exceptions rather than the norms and also those stories still tended to end tragically. When it comes to Fairy the only generality we can really make is that we can't easily make any generalities. Fairies are nice - Fairies can be nice, but fairies are not nice by nature anymore than people are. The idea that they all are all the time is entirely modern and an extreme break from actual folklore. I tend to point to the Victorians as the source on this one but its hard to pinpoint exactly when and what started this shift and I think in reality it was probably a combination of the Victorian flower fairy obsession, the New Age movement's emphasis on the positive and a conflation with the idea of spirit guides. This leaves us with modern popculture fairies who don't resemble historic ones; certainly Disney's Tinkerbell is an example of the stereotypical modern fairy but H. M. Barrie's Tinkerbell was pretty vicious. Fairies in folklore were not to be messed with and could - and would - kill, maim, or hurt people for what may seem to us to be trifling slights. Fairies are our Guides - this appears in both books and pagan culture more generally, the idea that fairies are a kind of spirit guide or are more highly evolved beings seeking to help humanity grow and develop. Some of them may perhaps be beings along these lines, there is after all a lot of diversity, and there is the idea in folklore that some people - especially witches - may have a particular individual fairy who helps them. But they are not all like this and I think it is an error to assume that every single fairy is a helpful spirit guide to all of humanity. for many kinds of fairies like Each Uisge or Hags we are nothing but a food source, and to others we simply don't matter at all. Fairies are small, winged creatures - This one I do solidly blame the Victorians for and the popularity of children's books during that time which featured little winged flower fairies. 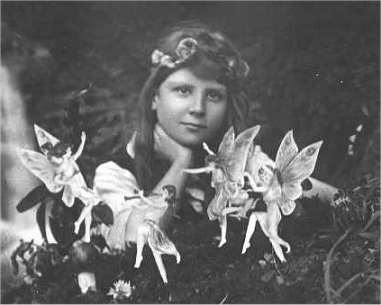 This compounded with the early 20th century Cottingley Fairy hoax seemed to have profoundly affected how people visualized fairies, something which has since been perpetuated by everything from Disney to the art of Amy Brown. In folklore, however, and many anecdotal accounts the Good People appear in a wide array of forms from animal to human-like from tiny to giant, from beautiful to monstrous. Wings are actually very uncommon features though. Fairies protecting the environment - Many modern pagans are firmly convinced that fairies are nature spirits and staunch protectors of the environment, an idea that appears in the works of pagan authors as well as movies (I'm looking at you Fern Gully). This is not something supported in actual folklore though but an idea that seems to have begun and gained popularity with humanity's own growing awareness of environmental concerns. It is true that many of the Fair Folk are extremely territorial and messing with their places is a profoundly bad idea - but this isn't due to a wider drive for them to protect our world so much as an urge for them to protect what belongs to them. There is, to my knowledge, not one single example in myth or folklore of the Good People appearing and warning anyone about the dangers of clear cutting forests, damning rivers, polluting, etc., prior to the modern era. And yes those things did happen historically which is why Europe isn't covered in forest anymore and has lost a variety of native species to extinction due to hunting. Fairies rescue abused children - Fairies in folklore were known to take a variety of human beings for a variety of purposes, not all of them positive. They would take brides and musicians, as well as midwives and nursing mothers. But they were also known to take infants and children and I think this is ultimately the root of the modern idea that they rescued abused children, however I will argue that saying they were rescuing these children is a modern recasting of the stories to soothe our sensibilities today. The idea appears in fiction dating back to the 1990's, at least, and gives a much nicer explanation for why the children were taken than folklore which says they were - effectively - breeding stock to supplement low population numbers among the Fey folk or servants. As with the other examples so far there is nothing in the actual folklore to indicate that the children taken were abused and in fact usually in the stories they seem to have been wanted and well loved, with many tales revolving around the parents struggle to get the child back. Maeve as Queen of the Unseelie - I admit this one baffled me when I ran across it. There are certain beings associated as queens of Fairy in Ireland and Maeve could be counted among them, however Ireland doesn't have the Seelie and Unseelie Court structure the way Scotland does, and as far as I know there is no Scottish equivalent to Maeve; also the Irish Maeve would not necessarily fit the mold of the Unseelie, never mind as a Queen of it. The English Mab who appears in Shakespeare is a queen of the fairies but is never mentioned as being Unseelie and is referred to as a midwife to the fairies and is associated with dreams and mischief making. Even Mab/Maeve's appearances in early 20th century literature hold to the view of her as a granter of wishes and giver of dreams. It isn't until very recently with the Dresden Files and The Iron Fey series, as far as I've been able to suss out, and possibly some television shows like Merlin, Lost Girl, and True Blood, that Queen Maeve/Mab has been cast in the role of the Unseelie and given a darker personality and inclination. As far as I can tell this is entirely based in modern fiction. These are only a handful of examples of ways that modern fairylore differs from traditional fairylore and has been influenced by popculture. Indeed new fiction and new movies continue to come out and the popular ones seem to inevitably find a way to effect what people believe about the Other Crowd. For example when a recent movie featuring a selkie came out (and a great movie it was too) which had the plot twist that the selkie couldn't speak without her sealskin coat I started seeing people repeating that tidbit as if it were traditional folklore, even though it is not. In a culture today where many people are disconnected from the traditional folklore and plugged into mass media and popculture it should not be surprising that it is fiction and movies that are shaping people's fairy beliefs rather than actual traditional folklore. *I can only point out here that the use of Grey Court for a third neutral court sitting between the so-called Light and Dark courts is exactly how it was used in the paranormal romance series. **none of the Fair Folk are 'good guys' by modern human standards. Morgan, I know you are a lot more "forgiving" of some of the so-called neo-pagan views on the fae. We in the Hellenic community have our various nymphs, satyrs, sirens, etc. who we know to honour; but, we also keep well away from them as well. In ancient Greece -- as well as in modern Russia -- there are men who are nympholepts who have totally left society in order to take care of the nymphs of a particular are. They are like hermits. No other person has anything else to do with them other then to occasionally leave milk and honey at particular spots known to be heavily trafficked. It is NOT romantic, so that part of the neo's mindset really torks me. Just call me Grumpy today ;-). On the Summer/Winter thing, I think that there is a certain amount of support for the idea being, if not present in ancient Celtic belief, at least highly compatible with it. As Alexei Kondratiev noted, the primary dualism in Celtic thought (and this applies, as far as we can tell, across Celtic cultures) was between "Summery" (samon) and "Wintry" (giamon) polarities. They weren't conceived in quite the same terms as we might think of them today (samon seems to have been an energetic and manifest sensibility, as it were, with giamon being more energizing and potential in character), but the basic division seems to have existed. It would be plausible, I think, for this division to give rise to a more good/evil dichotomy when adapted to Christianity in the 5th century and later. I'm quite fond of the idea myself and I agree that there can be support for aspects of it - Nicnevin's holiday being on the old date of Samhain in Scotland for example. and the wider idea of a summer fairy court and a winter fairy court can work well - I use it myself. *However* the idea as such doesn't exist in that form in the folklore or mythology, which was my larger point. I do agree with that point. "The idea that the Unseelie are just angst ridden bad boys trying to prove they can be good is really really just from modern fiction." This sounds remarkably like the shift away from the horrific vampire of Bram Stoker's Dracula to the sparkling vampire of Twilight.